Lately, a lot of people have been asking about using Nissan Leaf Cells in various projects, including smaller electric scooters. I happened to have my Vectrix battery pack out of the cycle, as I was planning on doing some work with it anyways. 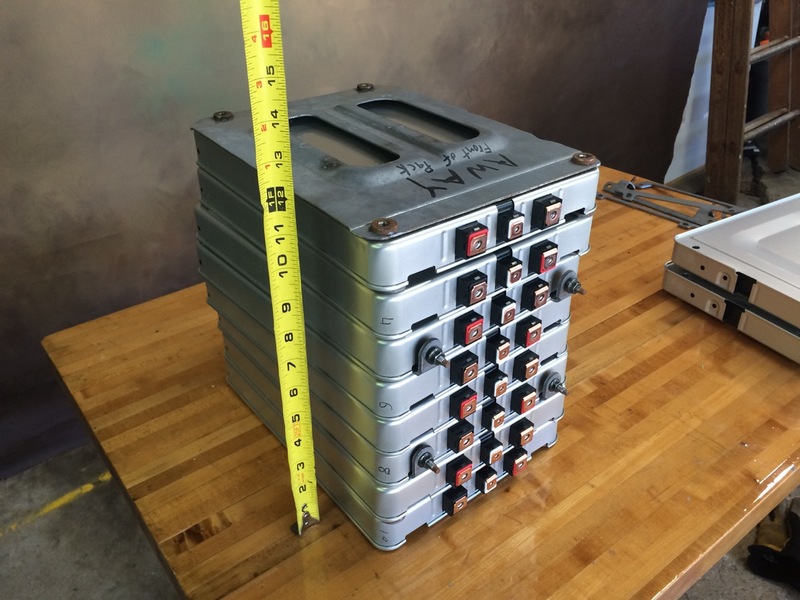 It LOOKED like a pack of 8 of these cell modules (for a 60V nominal pack) SHOULD fit in the battery compartment of a Flux Mopeds EM1 scooter. BUT, there was no way of telling for sure. So, I did what anyone would – tore apart the scooter to try cramming some batteries in there! The first step was to remove the plastic panels on the scooter. That gave me some room to see what was inside and what space I had to work with. In the bottom is sort of a sheet-metal tray. I built a pack from 8 of my Leaf cell modules and traced it out on cardboard. (You may already be familiar with C.A.D. – Cardboard Aided Design.) A simple cardboard template is much easier to lift and position than actual batteries. Just using this simple template, I could see that I would have to trim a bit of the metal from the tray. I used both an angle-grinder with a cut-off disc and a tin snips to remove some material on either side of the narrow portion of the tray. Once that was done, I could place the Leaf cells inside. I made a basic battery carrier by tying some heavy cord to the battery brackets. After the battery was in place, I could see that some plastic would still have to be trimmed from the inside seat compartment. I set that piece over the battery, marked where it looked like I needed to trim, and cut away the excess plastic with a jig-saw. After that, the the trim went right back over the battery and was bolted in place. At that point, the battery was in pretty solid. I installed the bus bars and an Anderson disconnect at either end of the pack. Next was plugging it in, flipping on the breaker, and testing the scooter! With it up on the double-kick-stand and the rear wheel off the ground, I flipped the scooter to ON and twisted the throttle. The rear tire spun to life! 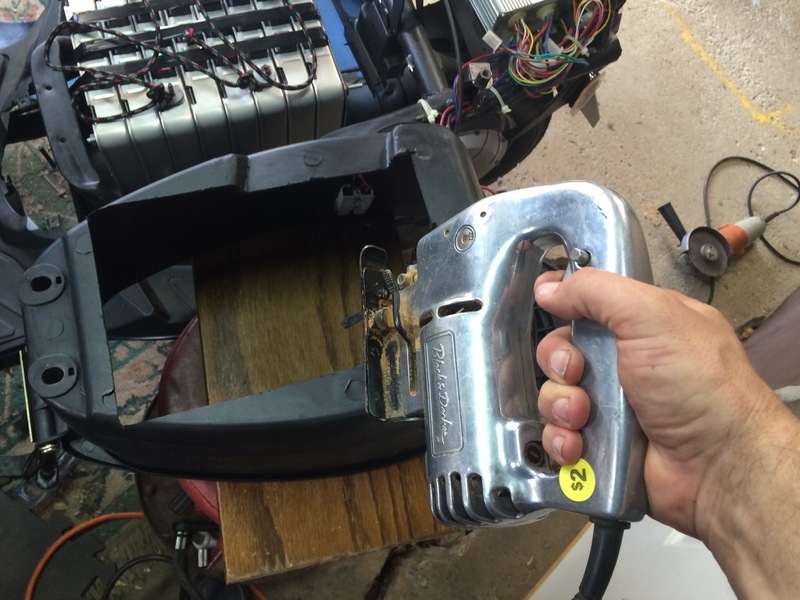 For proper permanent installation, it looks like an angle bracket could easily be installed on the front of the battery pack and reuse the machine screws that hold the front of the seat mount to the frame. A similar mounting point coming off the threaded rod would take care of the rear of the pack. I’ll give you a better update when I get the full “How-To” video put together, but that won’t be for a few days. In the mean time, enjoy these photos and stay charged up! I noticed you haven’t mentioned how you care for your Leaf Cells(charger and bms). How has your battery fared? Curious as I am planning a similar pack however in a different configuration. I was thinking Aluminum sheet and putting all the connections on the inside. Kind a a sandwich of four modules on four modules in a square to put under my trike. Installing Leaf cell modules in this scooter was just sort of a quick little project, and it wasn’t even my scooter. 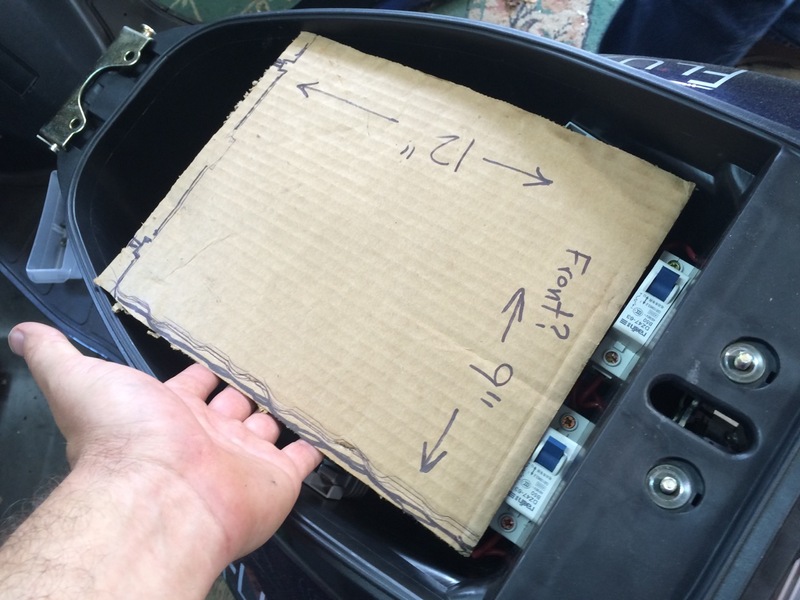 I have plenty of information on Leaf cells in regards to my Vectrix Electric Motorcycle. On that project, I’m bulk charging with Mean Well LED Drivers and NOT using a BMS. Leaf cells are rock solid. If you start with them balanced they stay balanced. Just set the chargers so that you don’t over-charge and have some sort of monitoring system to make sure you don’t discharge too far. 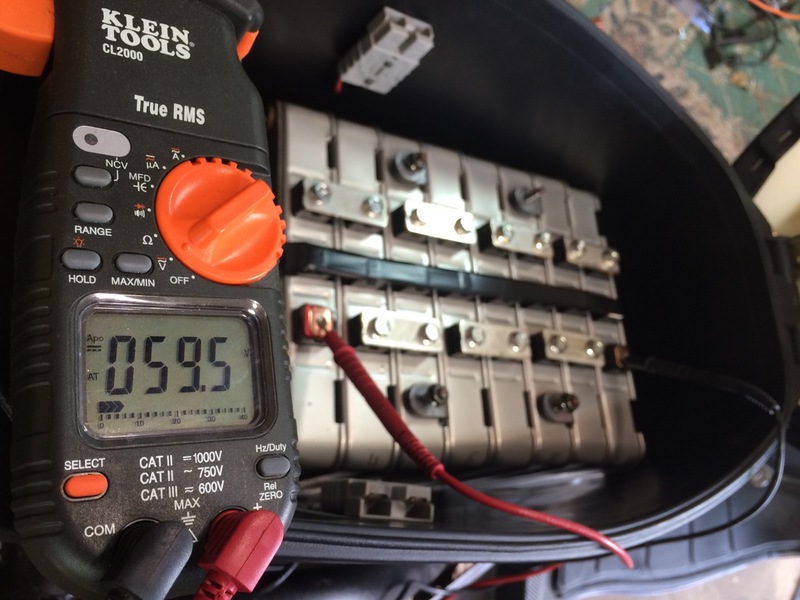 Check out the blog posts from July and August of 2015 for details of the Leaf batteries and charging on the Vectrix. Here’s one entry to get you started. The center portion of the Vectrix is essentially an aluminum tube which the batteries fit perfectly. Make sure your Leaf cells are sandwiched together with some threaded rod, and that they are protected from the weather and road dirt/grime. Metal always makes a durable battery box, but make sure to design things so that the cells can never accidentally short-circuit. Here are a pair of blog entries on the Leaf modules in the Vectrix. For more information, just type “Vectrix” into the search box here on 300MPG.org.